As a hockey fan and hockey dad who finds himself spending hundreds of hours driving to and from arenas throughout the winter I applaud the Minnesota Wild's move from WCCO to KFAN as its flagship radio home. As a Twin Cities resident, I follow the Wild closely and I cover their home games as my schedule permits but the previous situation made it difficult many times when traveling. The Wild has spent 10 seasons allowing WCCO to treat them like a red-headed stepchild, preempting Wild games in favor of University of Minnesota sports along with political events already being covered by dozens of other outlets. Clear Channel Minneapolis Operations Manager Gregg Swedberg assured me that, while conflicts may still arise--Vikings and Gopher football are also carried by KFAN--the station and the Wild will work in tandem to make every effort to avoid them. "I think we counted three potential conflicts this year," said Swedberg in an email. "One of the reasons the Wild left ‘CCO, from what we’ve been told, is that WCCO had no problem with moving the games. We really do not want to do it, and with only football to compete with, we don’t think we’ll have to." But, as Swedberg added, if games are moved they are shifted to KOOL 108 FM's 100,000 watt signal. In contrast, 'CCO made matters worse by moving Wild games to low-powered sister stations (BOB 106.1 FM and La Mera Buena 107.5 FM) offering ridiculously poor reception in such distant locales such as downtown St. Paul. I have literally found it easier to pick up NHL games out of Chicago, Detroit, Denver, or Montreal (in French no less) over the years than a broadcast emanating from my hometown. I know, I know, there are environmental factors which contribute to this--ionospheric conditions this and skywave effect that--which require most 50,000 watt stations, including KFAN (but not WCCO), to reduce power after sunset. 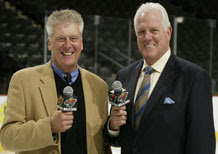 But any self-respecting NHL franchise would not be content with the quality of reception provided to fans of the Minnesota Wild by its radio partners on many occasions throughout the years. "For 90% of the metro, our night signal works," said Swedberg. "It’s not WCCO, we know. But it’s probably the second best signal in town at night. We also run our signal on 103.5 (FM), which covers the downtowns very well, even if it never gets past the 494-694 loop. But it does offer indoor coverage downtown, which WCCO can’t do, being an AM." Yet another plus to the switch is that KFAN is retaining the current on-air trio of Bob Kurtz, Tom Reid, and Kevin Falness promising the Wild a seamless transition to its new home. Some may not agree with that assessment but I find Kurtz enjoyable to listen to much like I did growing up with him calling Minnesota Twins baseball and Minnesota North Stars games on television. While I'm not as enamored with Reid--it would help if he'd remove the phrase "that point position" from his lexicon--he's somewhat of a local icon and has good chemistry with Kurtz. Falness and his face-defying voice has grown on me as has his jousting with Wild StarTribune beat-writer Michael Russo on Twitter. Combine those three with a deeper set of hockey analysts than WCCO ever had and Swedberg, a life-long hockey fan, is excited by the programming possibilities. "I think it will be great for hockey fans, as we really want to use Tom, Bob and Kevin on our station as regular guests," said Swedberg. "With Lou Nanne, Kevin Gorg, Pat Micheletti, Nate Miller, Brandon Mileski and our regular hosts (who know more hockey than they’ve shown), I would look for the Fan to really step up." On the surface, it appears that KFAN will offer the Minnesota Wild, and NHL hockey in general, something the franchise has lacked since its inception: a flagship radio station which treats the team as a valued asset. It's too bad it took 10 seasons for it to come to fruition but, as Swedberg says, it wasn't for lack of will on KFAN's part. "One of our biggest frustrations is that we never even had the opportunity to pitch the Wild before this year. Because all the sports deals came up at the same time, and because frankly, WCCO wasn’t aggressive enough, we were able to get in front of the team." 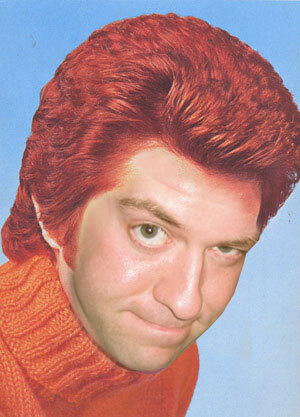 Well, as a redhead, I'm slightly offended. As one of only 3% of the world's population, the rest of you brown and yellow and black heads should feel honored to know us gingers.